The international FAIR project is promising the highest intensities for relativistic beams of stable and unstable heavy nuclei, combined with the strongest available electromagnetic fields, for a broad range of experiments. This will allow the extension of atomic-physics research across virtually the full range of atomic matter, i.e. concerning the accessible ionic charge states as well as beam energies. In SPARC experiments in two major research areas are planed: collision dynamics in strong electro-magnetic fields and fundamental interactions between electrons and heavy nuclei up to bare uranium. In the first area we will use the relativistic heavy ions for a wide range of collision studies. In the extremely short, relativistically enhanced field pulses, the critical field limit (Schwinger limit) for lepton-pair production can be surpassed by orders of magnitudes and breakdowns of perturbative approximations for pair production are expected. The detection methods of reaction microscopes will give the momentum of all fragments when atoms or molecules are disintegrating in strong field pulses of the ions. This allows exploring regimes of multi-photon processes that are still far from being reached with high-power lasers. In particular, the storage ring HESR will be exploited for collision studies. Here, fundamental atomic processes can be investigated for cooled heavy-ions at well-defined charge states interacting with photons, electrons and atoms. These studies can even be extended at the CRYRING at ESR to the low-energy regime where the atomic interactions are dominated by strong perturbations and quasi-molecular effects. The other class of experiments will focus on structure studies of selected highly-charged ion species, a field that is still largely unexplored; with determinations of properties of stable and unstable nuclei by atomic physics techniques on the one hand, and precision tests of quantum electrodynamics (QED) and fundamental interactions in extremely strong electromagnetic fields on the other hand. Different complementary approaches such as relativistic Doppler boosts of optical or X-UV laser photons to the X-ray regime, coherent radiation by channeling of relativistic ions (at the APPA cave), electron-ion recombination, and electron and photon spectroscopy will be used and will give hitherto unreachable accuracies. These laser techniques can also be used to laser-cool the relativistic heavy ions to extremely low temperature, which could lead to a break-through in accelerator technology. Another important scenario for this class of experiments will be the slowing-down, trapping and cooling of particles in the ion trap facility HITRAP. This scenario will enable high-accuracy experiments in the realm of atomic and nuclear physics, as well as highly-sensitive tests of the Standard Model. The most recent developments at FAIR with respect to the atomic physics collaborations are closely related to the novel physics opportunities provided by the heavy ion storage ring experiments at the HESR and to the transfer of CRYRING to the current ESR. Whereas the high energy APPA cave offers direct SIS100 beams of highly charged heavy ions up to 10 GeV/u, HESR can store cooled beams at energies of up to a few GeV/u (not feasible at any other place in the world). The High-Energy Storage Ring (HESR), which was primarily designed for experiments with stored and cooled anti-protons , turned out to be a well-suited facility which can accommodate a range of SPARC experiments with high-energy stored heavy-ion beams. The HESR can store cooled beams at energies of up to a few GeV/u and can thus enable unique atomic physics experiments which are not feasible at any other place in the world. This is in particular true for the use of cooled ion beams at relativistic energies with g-values ranging from 2 to 6, an option unambiguously documented in a recent feasibility study . This feasibility study is considering electron cooling, stochastic cooling, ion optical properties at the foreseen location of the internal target as well as storage times relevant for the planned in-ring experiments. Together with the specified, unrivalled properties of the HESR, the frequencies of novel laser and laser-driven sources in the visible and the x-ray regime can even be boosted in combined experiments with heavy ions. Soft x-ray lasers, as developed for experiments at ESR will now give access to the study of transitions at much higher transition energies. Especially, the interaction of highly-charged relativistic ions with novel multi-keV photon sources will access new regimes of non-linear photon matter interaction and the effects of QED in strong Coulomb fields. Further physics topics to be addressed are: pair-production phenomena, relativistic photon-matter interaction, correlated electron motion studied by target double-ionization, test of special relativity, bound state QED and nuclear parameters, exotic nuclear decay modes in highly-charged ions, and parity non-conservation in high-Z ions and extreme electromagnetic fields. As part of the Swedish in-kind contribution to FAIR, CRYRINGhas long been foreseen for relocation to Darmstadt, as integral instrument for the FLAIR facility . 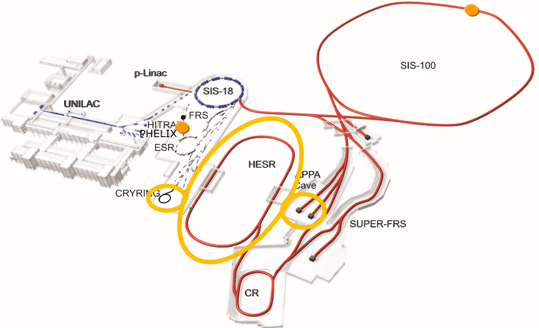 In a Swedish-German joint effort, a project group has worked out a strategy for an early installation of CRYRING in the evolving GSI/FAIR accelerator complex . Downstream of ESR an ideal location for setting up CRYRING was found (Fig. 4) where at minimum cost the access to beams of all ion species available at GSI is guaranteed and opens an exciting opportunity for novel research. The scientific program of CRYRING@ESR will focus on atomic and nuclear physics of exotic systems, exploiting the available unique gas jet target and electron target, bridging the gap between the beam energies at the ESR (≥ 4 MeV/u) and at HITRAP (≤ 5 keV/q). The fast ramping capability of CRYRING will give access to intense beams of bare and exotic nuclei at low energies. Thus, atomic collisions can be studied in the adiabatic regime by recoil ion momentum spectroscopy and, in addition, the low Doppler shift/spread provides unique conditions for atomic structure investigations based on electron and photon detection. With its independent RFQ injector beam line, CRYRING@ESR will serve as test bed for prototyping FAIR components in an operating environment.